Powder is extremely well-suited for thermal insulation when there is a jumble of different sized nanoparticles in it. This was discovered by a research group at the University of Bayreuth led by Prof. Dr. Markus Retsch. The scientists were able to determine how the thermal conductivity of powder is influenced by order and chaos in its constituent parts. They have published their findings in the journal Advanced Materials. The starting point of the research was phototonic crystals that occur naturally in various species of insects. For example, they are responsible for the colourful, glittering appearance of butterflies’ wings. Such crystals are easy to replicate in the laboratory using polymer nanoparticles. They possess a fine, regular, and stable structure. The effect of this well-ordered structure is that it becomes difficult for heat to flow through the crystals. Thermal conductivity is low. The researchers in Bayreuth have now found out that materials can be produced from such nanoparticles which exhibit a thermal conductivity that is even much lower. These materials are mixtures in powder form: crystalline order is thus replaced with chaos, and the pleasant interplay of colours also ceases. While each particle in the interior of photonic crystals is surrounded by exactly twelve particles in the direct vicinity, the number of directly neighbouring particles in the mixture is inconsistent throughout. Consequently, heat must take circuitous routes, making it all the more difficult to permeate the mixture. Flowing from the warm side to the cold side in a chaotic structure is not as easy for the heat as it is in well-ordered crystals. To completely clarify these relationships, Prof. Dr. Markus Retsch and his team used a combination of laboratory experiments and computer simulations. This allowed them to examine in detail how the composition of the particle mixture affects the flow of heat. The highest insulation effect is reached by mixing a very large number of small particles with fewer large particles. In addition to the mixing ratio, the difference in size between the two types of particles also plays a crucial role. “Making reproducible chaos and describing it via simulations is not as easy as it sounds,” explained Prof. Retsch about the challenges of this study. “It was only possible to compare our experimental results with computer simulations because we mixed nanoparticles whose behaviour we can control very well,” he said. 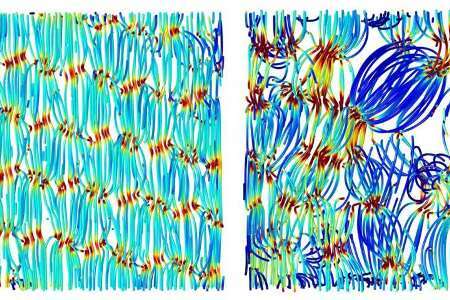 In this way, the researchers at the University of Bayreuth were able to gain detailed insights into heat distribution in disordered materials. These findings are highly relevant to many applications, especially in the field of thermal insulation. For example, they can help to improve the thermal insulation performance of bulk powders. However, they also provide valuable clues for technical applications which, conversely, rely on quick and highly controllable heat dissipation. This is the case, for instance, in the optimization of industrial sintering processes in which tiny particles of powder are melted. The key is to precisely regulate the temperature at the melting points, which is possible thanks to improved dissipation.